Extremely warm and cozy my girlfriend picked it out and loves it. The only complaint I have is you can see a few spots where they stitched the fur side to the pattern side. No big deal to me but would be nice to know. Never feel cold again with this incredibly soft and comfy reversible comforter. One side features a grey and pink geometric pattern, and the other side has soft faux fur in a grey chevron-pattern. Use the geometric side during warmer months and the faux fur side once it gets chilly. 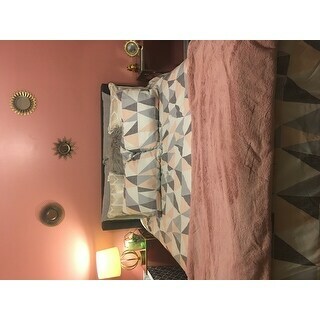 Not only does this comforter set have a unique, modern design, it is incredibly comfortable and transitions with the seasons. It is so satisfying to sleep with the fuzzy side of the comforter (or pillows!) next to the skin, but on warmer nights you can just flip it to the other side. I just had guests stay over and they were impressed with the look and feel. I added pillows (the shams are behind) but I love this comforter set. Got it for my 10 year old daughters room. She loves the soft fur underneath. Everything is reversible too! The soft side of this comforter is to die for! So soft, so cozy...perfect! I'm really happy with this comforter! I have a queen and it fits perfectly. I love the soft side of the comforter! Very cozy! This comforter is warm and soft and washes well. I have loved its coziness and plush underside during the winter months. 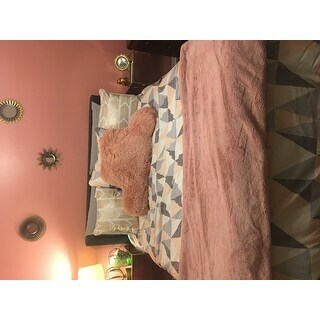 I would recommend this purchase -- the comforter is well worth its value price and more. What I like most about this reverse comforter is the first guest that slept in the bed said the next morning was that the comforter was the perfect weight. It deserves five stars. It also washes and dries nicely. We love this ensemble and the colors of gray and blush. The comforter is quite warm - we've had both sides on top and fine the gray on bottom is much warmer and softer for us. These have held up soooooo much better than I thought they would for the price! I purchased one for my bed I liked my daughters so much! Mine stays on the gray side. Due to elderly pets, I’ve had to wash these several times & they’ve held up way better than I ever thought they would. Still soft and fluffy! Love love love them! Very soft - didn't realize there was faux fur on the underside but looks like that is stated in the description (oops). Was going to return, but then realized how soft it is! 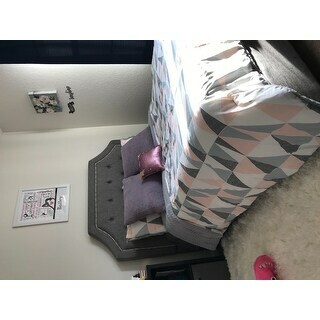 Got this comforter for my 13 yo old daughters bed she loves it! Especially the soft fuzzy size! I washed it once and it was ruined. All the stuffing gathered up. I had to get a new one. This comforter is sooooo soft. It is perfect for a little girls room. a friend just got the same one and it is awesome ! !